Plants are often a key part of what makes aquariums such eye-catching features in living rooms. Community or biotope aquariums offer plenty of scope for imagination. However, underwater plants offer far more than just decorative benefits. Read on to discover why beautiful aquarium plants are a must for your underwater world as well as for tips on how to look after them. Please note, however, that goldfish and cichlid aquariums, for example, have very different requirements when it comes to their plant life. Small leaved, long leaved, green or reddish, floating or ground cover – aquarium plants come in all sorts of different varieties. They can be used to create visual highlights as well as to structure and organise your underwater world. Although aquatic plants in aquariums sometimes grow and look differently to those in their natural habitats, fish and shrimps still love them. For example, they offer them places to hide and lay their eggs. Plants are also used to give structure to aquariums. Ground cover plants and mosses tend to be placed at the front of an aquarium, half-height or more bushy plants in the middle and long-leaved plants at the back in the aquarium current. When purchasing aquatic plants, you should therefore pay attention to their future height and shape. Furthermore, there are aquarium plants that you can decoratively attach to roots or stones, or even allow to float freely in the water. Details of particularly popular aquarium plants can be found in our article Popular aquarium plants. One major benefit in aquariums should not be underestimated: plants affect the chemical composition of the water. They remove nutrients such as nitrate or phosphate, which are partly produced from the metabolic waste products of the creatures in the aquarium. At the same time, aquarium plants enrich the water with oxygen, which is required by fish and other creatures. However, they only do this during daylight hours. At night, even underwater plants use oxygen, explaining why additional aeration can be highly recommended at this time of day. An aquarium’s lighting also plays an important role with regard to plant growth. As many aquarium plants are of tropical origin, they should receive about nine to twelve hours of light per day. And it is not just the length of this illuminated period that matters, but also the quality of the light. For aquarium plants to flourish, they also have requirements with regard to the water’s chemical composition. Just like land plants, underwater ones require oxygen at night and carbon dioxide during the day to allow them to grow. However, adding extra carbon dioxide to the water affects its carbonate hardness and pH level. We therefore recommend regularly checking the water parameters and making sure that these fluctuate as normal over the course of the day/night cycle. To achieve beautiful growth, plants should never suffer from a lack of trace elements, such as iron. Although many trace elements are replenished during regular partial water changes, this does not normally suffice for lush plant growth. As a result, you should regularly treat your aquarium plants to a special aquatic plant fertiliser. The exact type of fertiliser to be used often depends on the aquatic plant species. Good aquatic plant fertilisers contain such carefully balanced levels of fertilising substances and trace elements that you can simply use them in line with their recommended dosage instructions. If your aquarium plants already show signs of deficiencies, however, you probably need to give them a little more fertiliser – being careful not to overdo it of course. For more information about plant care, please see our FAQs on aquarium plants. 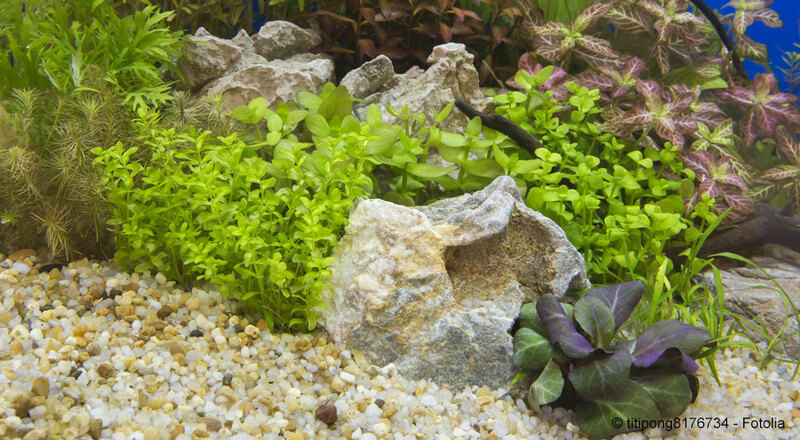 When setting up your aquarium, you can either mix fertiliser into the substrate yourself or opt for ready-to-use substrate that already has an effective slow-release fertiliser mixed into it followed by a layer of gravel, for example. Tip: before inserting the aquarium plants , trim their roots and remove any old leaves. The layer of fertiliser on the floor of the aquarium will sooner or later lose its effectiveness but can be refreshed with fertiliser pellets or tablets, for example. As a general bit of advice, it is usually better to plant rooted aquarium plants in gravel rather than sand. This allows the nutrients to circulate more effectively as the nutrient and water supply is generally better and the risk of areas of non-oxygenated decomposition is lower. Although real aquarium plants are no doubt beautiful, it can sometimes be necessary to opt for plastic ones instead if you want a presentable plant world in your aquarium. This is the case, for example, if your aquarium creatures have a tendency to be destructive. Some crabs and fish like to burrow into the substrate and pull up real aquarium plants.